Board of Trustees Chair Wendy Brandon hugs Seminole State President E. Ann McGee at the dedication of the Student Center Jan. 19. McGee recognized the ongoing support of Gerry Weldon, known as the first lady of Seminole State. Weldon was in attendance at the chilly ceremony, and she is the widow of the college’s founding President Dr. Earl Weldon. McGee also thanked Patty Sheehan, the District 4 Orlando commissioner for her help. Sheehan became the voice for Central Florida following the Pulse nightclub shootings. Seminole State Board of Trustees Chair Wendy Brandon embraced McGee as she made remarks at the ceremony. She also acknowledged the contributions of students. 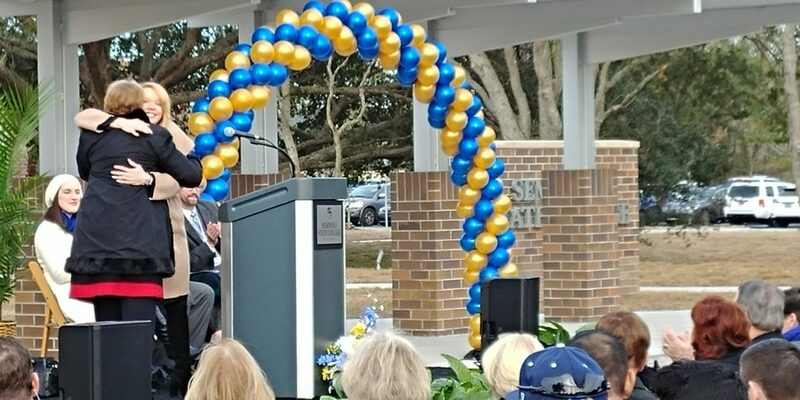 One of those students, Caleb Hylton, two-time and current president of the Sanford/Lake Mary campus Student Government Association, was a featured speaker at the dedication ceremony. He said the Student Center stood as a testament of the collaborative efforts of the student government and other departments. “The new student center stands as an example of those values in a tangible form,” Hylton said. He explained how students helped determine the style of the food court, the game room, and the layout of the offices. The new student center also stands as “an example of a college who puts the student’s first, students who want to make a change,” Hylton said. McGee also told the crowd that their work isn’t finished. She said the Student Center will be fully completed in March. After that, she said, focus would switch to renovating the gym into a wellness center as their next project. 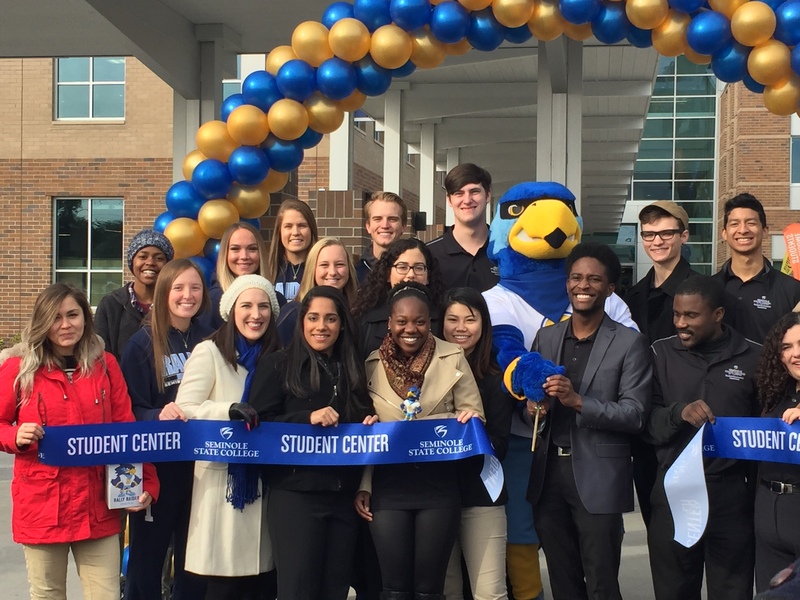 After the remarks, McGee, administrators, and students cut the ribbon officially opening the new Student Center. Everyone attending then entered the building for tours after grabbing some free food and even bobble heads of the school’s very own Seminole State mascot, Rally Raider. 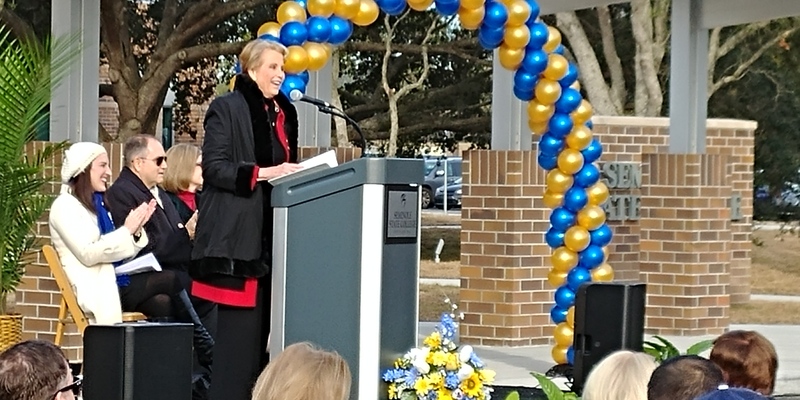 Elizabeth “Betsy” Prokes, student government vice president at the Heathrow campus, served as emcee for the dedication ceremony. After her announcements, the college’s very own SeminoleSound sang the National Anthem. Later that morning, the festivities included The Raider Hunt, which included intellectual and physical challenges in an “Amazing Race”-style event as well as a 1.7-mile run, walk, and roll with the Seminole Striders. Dr. E. Ann McGee makes her opening remarks at the dedication of the new Student Center.